At Kenny's Tile, we are your home remodeling company in Leawood, KS. Professional service and 100 percent customer satisfaction are our mottos. We are the trusted name for expert installation of tile floors, kitchen countertops, carpeting and bathroom fixtures. We offer our Leawood customers some of the finest quality tile and stone flooring products on the market. Our company will install brand new carpet, repair or replace worn out staircases and stairwells, offer the finest quality bathtubs and bath fixtures, or design a customized project for those wanting hardwood floors. We are a locally owned company with a complete showroom open to the public, and we invite our Leawood neighbors to come in and view the enormous selection of carpets, pre-finished hardwood floor products, granite and marble countertop tiles, and beautiful Carver bathtubs. Whether for the floors, walls or kitchen countertops, nothing speaks of elegance and taste like stone tiles. Our company imports granite and marble directly from quarrying operations in Europe and South America, and our representatives will be happy to show our Leawood customers every color, pattern and texture. We offer customers a free in-home inspection and price quote, and will build the kitchen countertop to exact specifications.We offer granite, marble, and travertine countertops custom made for your kitchen or bathrooom. Our professional team can then make sure the countertop is properly installed. Our showroom also offers one of the widest selections of granite, marble, and travertine in the Kansas City area. Kenny's Tile can install or provide hardwood floor refinishing in your Leawood home. Homeowners dream of having their living room or hallway covered in beautifully finished and stained ash, oak, or walnut flooring. Our company uses only the finest quality wood materials, and we have our own state-of-the-art pre-finishing facility. This fabrication plant produces beautiful wood strips which not only have excellent insulating properties, they increase the value of the home significantly. Leawood customers can also choose from a large selection of unfinished products and have their floor stained or varnished after installation is completed. Kenny's also can handle hardwood floor refinishing for your Leawood home. We use a dustless floor refinishing system that makes the whole process virtually dust-free. Our hardwood floor refinishing experts can then help you choose the right stain and finish for your floors. Call us today for a free estimate to refinish the hardwood floors in your Leawood home. Kenny's provides quality carpet installations for homes in the Leawood area. Our showroom has a wide selection of carpet available that fits the styling and decor of any home. Our carpet department pre-cuts and pre-seams all of our jobs in our carpet warehouse to ensure a quality installation in your home. We carry a wide range of carpet, including berber, frieze, saxony, texture, and velvet/plush. Once you choose your favorite style and color, our professional installation crew will make sure to bring a high level of craftsmanship to the carpet installation in your Leawood home. This ensures the carpet will look good and satisfy manufacturer warranties. Call or visit our showroom today! Our company can design a custom stairwell made from hardwood, furnish it with beautiful spindles and handrails, and stain it according to the customer's directions. Kenny's Tile performs the complete operation, from customer product selection to the final installation and finishing. Our wonderful selection of handrails, balusters, newel posts and shoe molds can be viewed at our local showroom. Our showroom contains the complete line of Carver bathtubs, many of them whirlpool and massage type models. We are the actual manufacturer of the Carver brand of bathtubs, and can customize each tub for your particular needs. We have been manufacturing this line of bathtubs for over 20 years, and can even customize the position of the whirlpool and air massage jet systems. We have various sizes of bathtubs available, and even have large corner models. Our team of professionals can consult with you in your Leawood home and show you the best solution for your bathroom remodel. You can also visit our showroom just a few minutes from Leawood at 3251 Main St in Grandview, MO. A home improvement project that includes the installation of stone tiles, home remodeling in Leawood, repair of the kitchen countertop, designing an elegant new bathroom, or replacing old carpet is best accomplished with a call to Kenny's Tile. 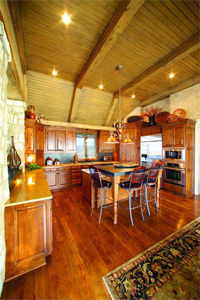 We are the Leawood experts for flooring products and kitchen/bath fixtures. We install promptly and offer a complete customer satisfaction guarantee on all our work. Visit our showroom and see for yourself how we pride ourselves on offering only the finest quality materials at less than retail prices.